Anatomy and behavior The GW is a viviparous epipelagic fish, observed mostly in the presence of colonies of fur seals (Arctocephalus), sea lions, cetaceans, other sharks, and large bony fish species. The injuries seen at the often scarred bodies of females are mating scars, but could also result from bites from their prey, like the powerful elephant seal (Mirounga angustirostris). Male great whites on the average measure 3.4 to 4.0 m long, females 4.6 to 4.9 m According to J. E. Randall, the largest white shark reliably measured was a 5.94 m individual reported from Ledge Point, Western Australia in 1987. GWs have the typical torpedo-shape of the of mackerel sharks (Lemnidae) which, combined with their muscular tails, can propel them through the water at speeds of 24 kmph, or even break the water surface when they attempt a vertical attack on prey swimming at the surface. A breach is the result of a high speed approach to the surface with the resulting momentum taking the shark partially or completely clear of the water. It is a hunting technique employed by GWs whilst hunting seals. Because the behavior is unpredictable, it has been very hard to put on film or video. It was first photographed by Chris Fallows and Rob Lawrence who developed the technique of towing a slow-moving seal decoy to trick the sharks to breach. Between April and September, scientists may observe around 600 breaches. Most successful attemps occur in the early morning. Reputation Many superlatives haven been used to characterize the dangerous side of GWs: ‘magnificent monster’, ‘terrifying creature’, ‘razor sharp teeth, beady black eyes’, ‘the ocean’s deadliest predator lurking beneath the waves’, ‘ ready to strike without warning‘. But the bloodthirsty reputation of this magnificent shark can be largely ascribed to films and sensation documentaries. GW attacks are extremely rare, even when people swim in close proximity to them. Still, GWs are held responsible for the relatively large number of reported and identified fatal shark attacks on humans. One obvious factor that is likely to trigger an attack is the blood and vibrations spread in the water by a fish speared in its territory. Another factor is that GWs, like some other predator sharks, exhibit a behavior called test biting. Basically, they are interested in spotting what looks like a food source. An initial bump may be followed by a test bite on a human, after which the shark will probably never return again. 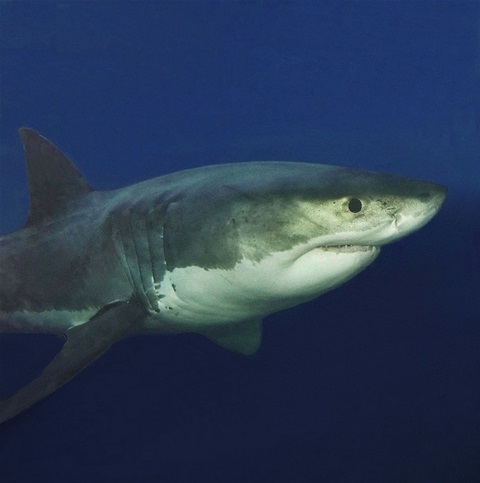 Fatalities from shark bites in fact are quite rare and caused by blood loss from an initial test bite. Sometimes an attack might occur in shallow and turbulent water of the surf, where the shark mistakes the silhouette of a paddling surfer for its natural prey, the seal. Fatalities almost never result from critical organ loss or from whole consumption. Cage diving There are currently three major locations for divers to visit the GW from inside a cage. Cage diving is most common at sites were whites are frequent, including the northern Neptune Islands in South Australia, Guadalupe Island in Baja California and off Seal Island, False Bay in South Africa. At Isla Guadalupe several live aboards can be lined up during the high season, forming an avenue of boats. Each with cages underneath and a couple of divers inside, shivering in the cold water filled with chum. Here the chances of getting a good shot of a GW are pretty good, but too many boats in the area may spread out the sharks and restrict the chances of a successful close passing for the individual UW photographer. I must admit that my visit to the island a couple of years ago did not result in a high ranking on my list of favorite shark sites. Cage-free diving with GWs. Man inside, animal outside cage is a slogan that would probably receive much approval from members of Animal Lib. Personally I dislike observing wild animals from behind bars (this holds for two directions). Ever since the moment that divers felt safe to go out in open water to meet sharks, boundaries have been pushed and now include predators that were formerly seen as highly dangerous, such as Tiger Sharks and Oceanic white tips. The GW however was always considered as a special case, a more ‘raw’ and unpredictable species never to be approached in open water. But is there any biologically plausible reason why the GW should be treated as a rare exception? Free diving with GWs means that a diver leaves a cage or boat to meet or swim with the sharks in open water, sometimes only with a snorkel, fins and mask.Wisely, these GW events are not open for the public, but performed by experienced divers in favorable sea conditions, with relaxed sharks that often are accustomed to the visiting divers. Baiting could help in diverting the sharks attention from diver to bait, like it does with other species. For example Mike_Rutzen, a south African living in Gansbaai has spent a lifetime with GWs and taken a long time watching them and getting used to their behavior. He regards cage-free diving with GWs as something special to be done on unique occasions: a combination of a perfect day, perfect weather and a perfect shark. Man swimming among apex predators without direct danger of physical injury could help to expose myths created by movies like like Jaws. Perhaps commercial movies and documentaries built upon the sensation side would then loose a part of their profit. But they would also receive something else in return. Namely the opportunity to highlight for the public the attempts to observe and preserve miraculous creatures that lived for millions of years, but that are now on the verge of extinction.